An Electrochemical Cell is a device used to convert chemical energy (produced in a redox reaction) into electrical energy. Electrochemical Cells are also known as Galvanic or Voltaic Cells. It would be useful to be able to convert this chemical energy to electrical energy instead of heat energy. This is done by an electrochemical cell. Let us use the redox reaction given below to explain the construction of an Electrochemical Cell. This reaction can be split into the following two half reactions. 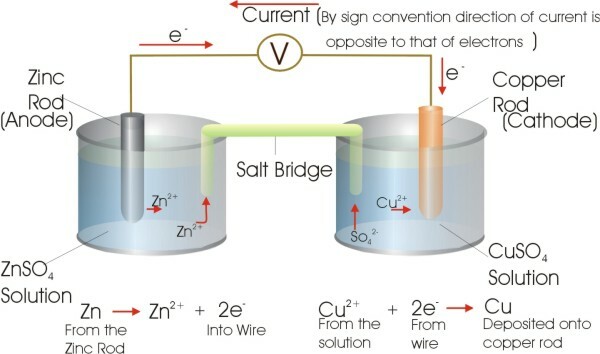 The oxidation reaction in the zinc rod releases two electrons.These two electrons are taken by the Copper ion in the copper sulphate solution. If these two half reactions can be separated then the electrons can be made to move through a wire. In this manner we can produce electical energy from chemical energy. The salt bridge is a concentrated solution of inert electrolytes. It is required for completing the circuit. It allows the movement of ions from one solution to the other.